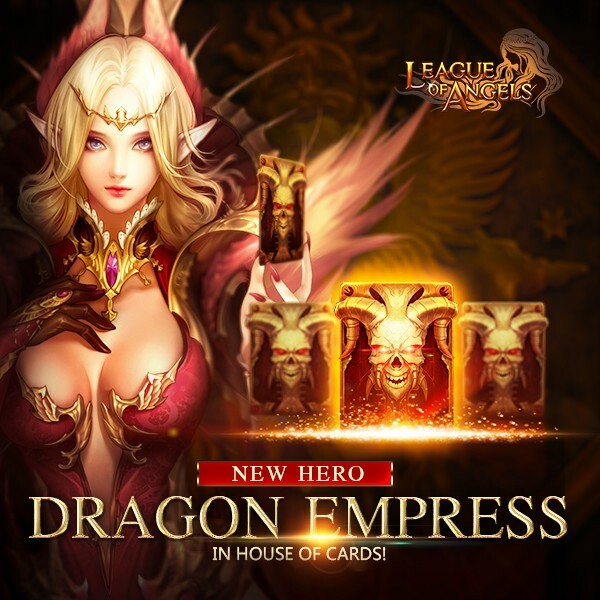 LoA_Win Dragon Empress in House of Cards! - You can swap the required cards for: Blazing Hecate, Herclues, Hecate, Earthshaker, Mountain God, Messenger of Darkness, Dragon Empress, Light Envoy, Lunar Priestess, Posedion, Panda Nicky, Dark Valkyrie, Lvl.8 Dodge+Hit Gem, Lvl.8 Patk+Crit, Lvl.8 MATK+Crit Gem and many more! - Total Ranking Rewards: At the end of the event, the Top 20 players with at least 10,000 total points have a chance to win Seraph's Stone, Joker (L), Gem Enhancement Stone, Element Crystal, Lvl. 8/7/6 Fusion Gem Chests. Description: You can get Card Lotto Vouchers from following daily tasks in the event Porker Master. Possible Prize: Lollipop, Super Lollipop, Wedding Garb, Ragged Treasure Hunt Chest, Card Lotto Voucher, Blessed Stone and Seraph's Stone. More exciting events are coming up through Dec. 23 to Dec. 26, check them out in the in-game How Events menu now!